Fictional detectives used to be unattached aristocrats or poets whose lives have been touched by tragedy -Rendell’s Adam Dalgleish, George’s Thomas Lynley- or no-nonsense suburban curmudgeons -Rendell’s Wexford. Nowadays they tend to be ex-army often special forces – Connelly’s Harry Bosch, Ian Rankin’s John Rebus, Lee Child’s Jack Reacher, Jo Nesbo’s Harry Hole – and of humble origins – Peter Robinson’s DCI Banks, . They tend to be outsiders and pariahs in their police departments like Rebus in his last appearance, retired and a cold case investigator. Often they are semi-destroyed by what they have seen, struggling with addictions -smoking, booze, hard drugs – and clinically depressed or worse – Henning Mankell’s Kurt Wallender. Some of them are music lovers – Banks, Rebus – and have picturesque cottages as they strive for peace -Banks, Wallender. Generally, they have failed marriages and single daughters who tend to follow their fathers into police work – Bosch, Wallender, Rebus – although Banks also has a musical son. Jack Reacher stands alone, never having married and pathologically unattached to home. Then there is Kate Atkinson’s Jackson Brodie. So far, Jackson Brodie has appeared in four of Atkinson’s novels: Case Studies; One Good Turn, A Jolly Murder Mystery; When Will There Be Good News? and Started Early, Took My Dog. He is typical of these latter day literary detectives in that he came from a mining family, quit school at 15 and joined the army. He is divorced, although his daughter is too young yet to join the police. Does he also have a son? He takes solace in music of the female country hurtin’ kind. Initially he longs for a country place in France but lately he’d be happy to find one in Yorkshire. As his surname suggests, his family came from Scotland, and, in some ways, he is what the Scots call a hard man – Rebus, Harry Hole, Jack Reacher, Harry Bosch. Note that I have called Jackson by his first name. Rebus is almost never called John; Reacher is never called Jack, although Harry Hole is often called Harry. Thank goodness. Otherwise, I would have had to keep reminding myself that in Norweigian, it is pronounced Whoolay. Jackson is quick to raise his fists, but he often gets the worst of the fight. One of Jackson’s appeals to this reader is his haplessness. When it comes to detecting chops – he doesn’t have Wallender’s skill at group think and analysis, nor Rebus’s and Harry Hole’s instinct. He quit the police force before Case Studies begins, so, as a private eye, his inside information, is compromised. Fortunately, he has formed a sort of partnership with DSI Louise Munroe in Edinburgh and he has his own private sources. It has to be said that the best thing about Jackson is his commitment, especially to lost girls. There was such a girl in his youth and that has made him what he is, doggedly persistent in his effort to help others who have lost girls, but sometimes as in Started Early, he doesn’t even know what’s going on. When he meets with success, it seems almost accidental. His sudden acquisition of wealth, a case in point. When I saw the first television series starring Jason Isaacs as Jackson, I didn’t get the humour. Somebody was trying to kill him in Case Studies, braining him from behind and moving on to arson and finally to vehicular homicide. As it turns out this maniac has a ‘justifiable’ motive, but it is totally baffling to Jackson and me. It is random and absurd, and it was only when I read the books that I began to see that it was also darkly funny. He had just been punched in the face by two different people before he was mugged, for example. One Good Turn begins with a minor rear-end accident in a narrow street in Edinburgh during the Fringe Festival and quickly escalates to attempted murder by baseball bat. The hero of the day stops that with a lucky throw of his laptop, but finds himself inextricably bound to the questionable character he has saved. Passing by, Jackson casually offers the ‘hero’ his card. Both are now on the ‘murderer’s’ to-do list. Mistaken identity adds yet another person to the list. Okay, I can see that you need to read the books to get the humour. One of the peculiar things about these books is that in the beginning, Jackson isn’t even mentioned. Whole chapters are given over to narratives about people he has never met, but who will eventually bring their cases to him. Atkinson is very good at bringing characters alive in all their complexity. We get into the minds of Amelia and Julia who lost their little sister when she was 3, into Theo’s mind who lost his 16 year-old daughter on her first day of work at his law firm and into the mind of an obsessive new mother, whose husband meets a grisly end involving an axe. It took me a while to learn to enjoy this method and not rush over them to get to Jackson. Jackson’s women are more than glad to tell him his faults and to take advantage of him, sometimes with what seem like dire results. Dire to the reader. Not to him. He has bad luck with women and trains. Accidentally, boarding the train bound for Scotland instead of the one for London turns out to be the least of his problems that day. At one time or another, he loses his wallet, his money, his car, but carries on with his original plans, although losing his actual identity does slow him down. Certainly he learns that old truth that no good deed goes unpunished. 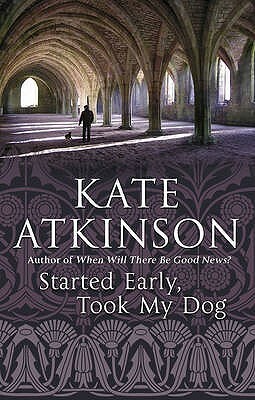 At least he ends up with a dog, which he takes to see the ruins of Fountains Abbey, as we can see on the cover of Started Early, Took My Dog. This entry was posted in reading, Uncategorized by joyceahowe/hood. Bookmark the permalink.